Tonight I will continue tasting my local Brooklyn beers with another numbered selection from Brooklyn Brewery, this one called Local 2. This Local pours a barely hazy, deep copper color with a thick, off-white head. The nose is lightly spicy. Coriander and cinnamon aromas meld with the nuttiness of the dark malts, and just a bit of alcohol spiciness rounds it out. Overall pleasant, but just a bit mild for a nine percent beer. The light spiciness seen in the aroma is more fully featured in the taste. Caramel and toast flavors from the malt and brown Belgian sugar form a springboard that the yeast character jumps off of. Black pepper, coriander, and nutmeg flavors explode in your mouth, accompanied by a significant alcohol warming. This is a big, rich beer, wholly unlike its little brother One. The palate is just right: full enough to support the flavor, light enough to stay out of the way, and dry enough to drink another glass. I haven’t posted for a while. I apologize. In my defense, I have been busy. I’ve moved from my idyllic residence on College Green in Iowa City to an apartment in the Flatbush neighborhood of Brooklyn, New York . 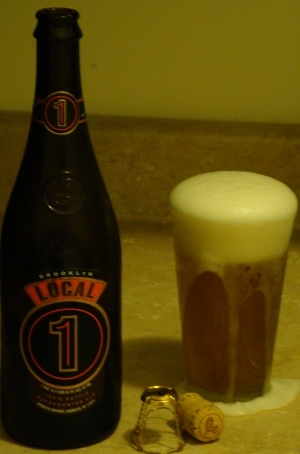 In honor of my new home, tonight I will be tasting a beer brewed by my local Brooklyn Brewery called Local 1. For extra credit I’ll be drinking it out of my Peace Tree glass. I don’t know if it’s just cause I brought it home on the subway, but this beer is very active. 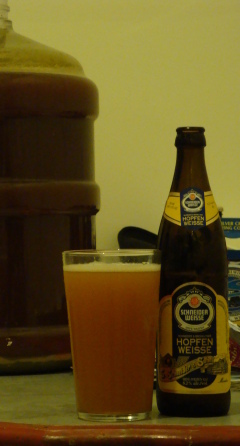 It pours a hazy pale straw with plenty of head (maybe due to the carbonation). The nose is rich with herbs and fruit from the hops. The malt lends a mild sweet character. Unfortunately, that herbal note ends up seeming just a bit soapy. The flavor is sweet. Rich herbal hops and a yeast spiciness add to the complexity, but ultimately, the pale malt flavor and sweetness pervade the flavor. This is a drinkable beer: refreshing, yet flavorful. But it is neither flavorful enough to drink very much of nor dry enough to drink very much of. Perhaps given the price tag that’s not much of a problem.